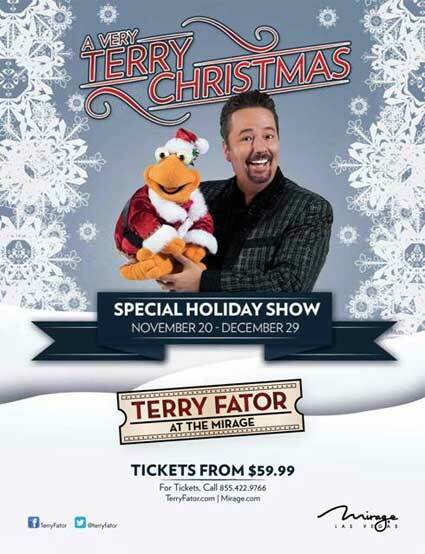 Ventriloquist Terry Fator brings the spirit of the season to the Las Vegas Strip with A Very Terry Christmas. The headliner has transformed his hit show at The Mirage Hotel & Casino into a more festive celebration complete with holiday classics and chestnuts roasting on the fire. This seasonal favorite begins Tuesday, Nov. 20 and will run through Saturday, Dec. 29. A Very Terry Christmas includes everything audiences love about Fator’s traditional show, but with a special holiday twist. The show is a combination of Fator’s incredible impressionist talents, classic holiday songs and plenty of laughs, making it both naughty and nice. Hailed Best All-Around Performer by the Las Vegas Review-Journal’s ”Best Of” Awards, the vocalist, comedian and celebrity impressionist has entertained hundreds of thousands of tourists since 2008. Fator’s rise to fame has been 32 years in the making, with humble cover band roots to winning the top prize on “America’s Got Talent” in 2007. As a successful headliner on The Strip, Fator has captured the hearts and funny bones of audiences worldwide. Fator does this with his perfect blend of singing, comedy and celebrity impressions, all backed by an incredible live band.